How does wayfinding design improve the travel experience? Applied Wayfinding’s Legible London project set a new standard for city wayfinding projects. We have interviewed Tim Fendley, Founder of Applied Wayfinding and designer of Legible London, the famous wayfinding system designed for the English capital city and now the most extensive of its kind in the world. The interview analyses some of the most interesting aspects of wayfinding design: citizens’ habits and touristic fruition influence, integration with public transport network, results measuring and success indicators, and finally public administrations role and investments needed to improve urban flows management. Which are the most important factors (urban and architectural elements, but also tourists and citizens’ habits) you overview and examine before starting a wayfinding design project in an urban context? To make a place more understandable you need to think about the public’s point of view. We specifically look for what is memorable, unique, interesting – and conversely what is similar and undifferentiated. We also observe sight-lines and the impact of landmarks. We use software to pull this together to create a ‘Legibility index’. There have been detailed studies on how humans navigate. The work of John O’Keefe and his discovery of place cells is particularly enlightening. If you can understand how the brain is constantly assessing locations and what it is using as a source for creating memory points, then you can see what information is best provided to enable people to create a better map of their own – if the architecture doesn’t do its job! This is always our fundamental objective. “Applied Wayfinding” has realised projects all over the world: how do local culture and habits influence planning choices? This is an interesting one, we see strong patterns in how people behave, but there are undeniable local differences, often to do with the city’s coding: Have you tried finding an address in Seoul, or seen how Americans get confused by the changing names of straight streets in London? When working on the wayfinding strategy for New York we often heard the view that Manhattan doesn’t need a lot of help, as it has numbered streets. Visitor research showed us that there was a gulf of knowledge between people who knew the city, and had worked out its shorthand codes, and the unfamiliar, who didn’t have a clue. The street grid was not as obvious as you might think, and the similarity of the junctions was a major disorientation. We’ve studied and we have some theories as to why this is, but that’s another story. The issue is that most places we work in are catering for an increasingly international audience and sometimes making a destination work for everyone requires making sense of the local customs and codes. Not always easy. 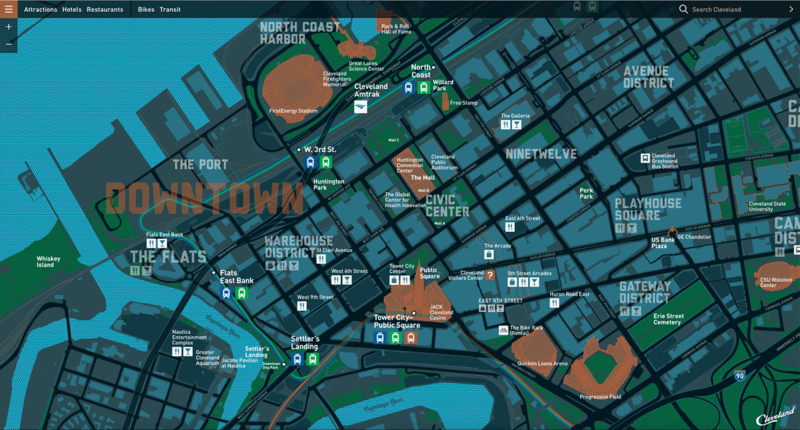 Applied delivered Cleveland’s extensive wayfinding system, which includes on-street signage; a printed map; and this interactive digital map, powered by Living Map. Which impact can a good wayfinding project have on citizens’ habits and touristic fruition of a city? We are fundamentally connecting people’s confidence and sense of ‘certainty’ with their enjoyment and impression of the place. When travellers have the ‘confidence to get lost’ we can statistically observe their desire to re-visit, and to make better and more positive choices about transport, and more likely to walk. A higher traversed environment is safer and better for the local economy. Retailers and many businesses rate the value of a site on the amount of passing traffic, so to be able to get people to walk, to venture into unknown quarters, supports local trade, street activation and overall urban well-being. The factors are all connected so the best strategy is to have a multi-pronged approach: street improvements, placemaking, al-fresco dining and traffic calming, linked together and supported by a coherent and citywide wayfinding scheme. A good integration between public transport network – based on the principles of intermodality – and wayfinding design produces a seamless mobility. In your opinion, which is the best project you realized integrating wayfinding design with public transport network? The ambition of seamless mobility is fantastic, it is based around the user and their journey. If it all fits together, it is easy, simple to remember and therefore generates many more and better journeys. The benefit of ‘seamless’ is way under-estimated in the view of wayfinding experts. The challenge is that a city’s many transport systems, including cycling and walking, are often run by more than one authority or set of operators – for good reason. Sometimes we don’t get the opportunity to connect the different systems, but can insert a new mode into an existing mix, such as with Legible London. For Vancouver we had an opportunity to work with almost every mode, with the prime goal to get them to work together, to create a multi-modal system. The project was successful and due to the projects wider goals it now encompasses all modes. It has become a multi-modal exemplar in North America. 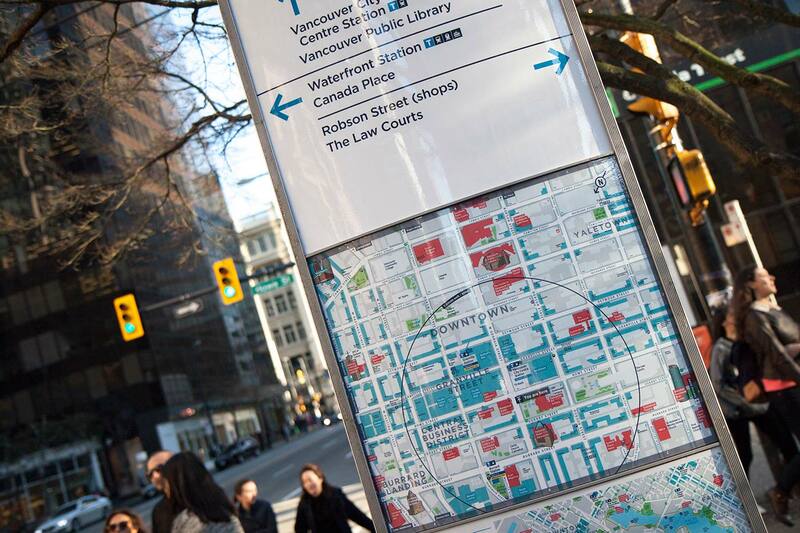 In Vancouver, BC, Applied worked with City of Vancouver, DVBIA, Tourism Vancouver, and TransLink to create a multi-modal wayfinding system. Which are the success indicators of wayfinding design projects? Which are the best results your most important projects have reached? The answer is always in the results – do people walk more? Do they leave with the desired impression? Prior to Legible London, the amount of walking was declining in Central London, people didn’t think they could do short-walks. This changed. Now the system is used over a billion times a year and multiple-studies attest to its positive impact. Statistical analysis can sometimes be hard to come by. It costs to keep assessing, and the impact of wayfinding is soft, other factors play a part. Saying that, the reports we have contributed to consistently support more than a five times return on investment for city wayfinding. This is an enormous return. It shows how maligned ‘software’ or information projects are viewed – they don’t attract the investment compared with the impact they deliver. Another indicator is to create a design icon, this helps, but an icon’s main value is to help achieve consensus among the many parties, so that one connected system can be created that makes sense to the end-user: the visiting and walking public. What I would really like the opportunity to record is how quickly a place can become memorable – and therefore connected to our thinking. In your experience, which are the investments public administrations should plan to improve the urban flows management? People will always need help to traverse new places, the more complex and less memorable the environment the harder it is. Changing the architecture or street layout is not always viable, but sometimes this would have the most impact. In New York we once suggested that the whole of Broadway should be laid to lawn and lined with trees. Real knowledge of people flow is actually light on the ground. The advent of big data and the IoT revolution should in theory provide us with a massive data-set from which to better understand movement in fine detail. We have been working with some of these data sources and interestingly it often resonates with our pre-observed patterns. Adding real-time and fine-grain will make understanding flow even better. Live data will allow us to better measure and respond immediately. The source of people’s stress, and therefore their barrier to travelling, lies at the connections: finding the station, changing mode, knowing which way to turn. A lot of dollars are spent on speeding up a carriage between these points. From a different perspective, real benefits would be quickly derived from the city’s software, the information provision, to optimize what currently exists. This would achieve better mobility and flow straight away, and overall would be a wiser early investment. Founder of Applied Wayfinding and Living Map Company. He is a graphic and information designer with a deep interest in making cities more understandable. He was the design lead for Bristol Legible City Initiative. With Applied he has created the multi-modal system for Vancouver, Seamless Cleveland, harmonising Toronto’s transport systems, legible schemes for Glasgow, Leeds, Brighton, Rio de Janeiro, and is currently working on Madrid, Seattle and Paris. Tim initiated Legible London – to make sense of a complex city. He envisioned the capital-wide pedestrian wayfinding system. Now the most extensive of its kind in the world and regarded as the international standard. Applied was established to create big-picture ideas that can be delivered. Tim has also established a mapping technology company, Living Map, to realise his vision of making geographic information easy-to-use and relevant for cities and buildings.